You’ve seen us media types at concerts, speaking engagements, sporting events, red carpets, etc. We run around with more cameras hanging from our necks than we have arms to operate them. Big, burly bouncers, bodyguards, and security personnel part like the Red Sea when we walk backstage. We are permitted to get close enough to dignitaries to take those exclusive photographs that grace the pages of your favorite magazines. All thanks to a laminated card called the media credential. That’s the glamorous part that most of you see. What you don’t see is what is required to get one of these passes. When the stars align and everything goes off like it should, your client will have already made arrangements with the media relations team. Your credentials may even have been sent to you in advance. If not, when you arrive on scene, all you have to do is walk up to the media table (or easily locate your contact, whose name was provided to you beforehand), pick up your media pass, and you’re good to go. Simple as that. You get great shots/interviews and your client is happy. I’d love to say that’s how it works all the time, but it doesn’t. There are those days when at least one thing will go wrong. And that goes for apprentices as well as seasoned pros with decades of experience. In fact, the episode I am about to relate to you occurs in one form or another more often than you would think. During these times I use the following principles to get the job done: 1) do your Research, 2) arrive Early, 3) be Patient but Persistent, 4) act Professionally. You can remember it by the mnemonic REPP, as in, create a good REPPutation. Sometimes your client will just tell you to meet them at a certain place. It is then up to you to get to the location (on your own) and set up access (again, on your own). A little time spent with sage Uncle Google ahead of time can save a ton of frustration down the road. In my most recent experience, all I knew beforehand was the name and location of the venue, and reason for the event. Using the Internet I learned that media credentials would be required, so I applied. Good information to know because I had to drive almost 250 miles to photograph this event and it would not have been cool to get there and not be able to get in. Arriving early should be a given. Doing so allows time to not only find the site, but to find the best location from which to photograph your client. In my experience here, I also needed the time to find the media station to collect my credentials. That wound up taking well over an hour, mainly because the venue spanned five blocks. I knew the right questions to ask to get to the media station. But the people I asked did not know the answers. I think I talked to about five people before reaching the right person. Hearing the response over the walkie-talkie, “yes, I remember that name” [see Research above] was like finding the pot of gold at the end of the rainbow. Ironically, the road meandered through a full circle before ending two doors from where it began…on the same floor of the same hotel. Also a given. But you’d be surprised how many photographers, reporters, etc., act unprofessionally on location. Bellowing an indignant “Do you know who I am?” to the security person is a good way to get shown the door…and it won’t be the one leading backstage. I’m digressing here but that line gets used a lot. And no, it doesn’t work. Even with them in hand, or swinging from a lanyard around your neck as is most common these days, media credentials are not always honored. About 15 minutes before show time, I arrived at the location where my client was going to be performing. Then I looked around for some nice background to photograph my client against afterward. That’s when I was stopped by security. (Security was tight for this event). I had just driven almost 250 miles – after driving an additional 120 miles earlier in the day – to get here. 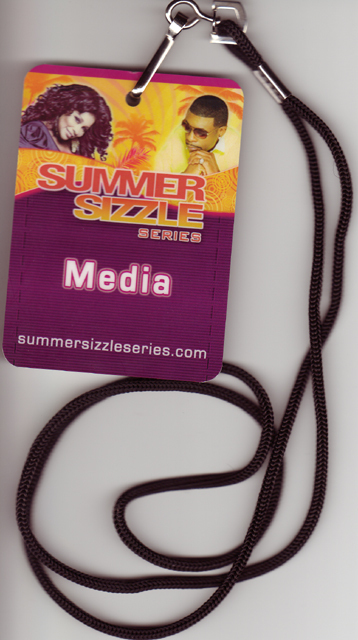 Temperatures were still in the mid-90’s, it was an outdoor event, I was badly dehydrated, very hungry, and had just spent nearly two hours trying to secure this media pass. Now it was being questioned. I stayed calm enough to explain to the person who challenged me why I was there, including how I applied for the credentials, while trying to keep in mind that he had a job to do, too. He accepted my explanation and the evening went on. The alternative? Say what was on my mind at the time and most certainly be tossed or detained. Then have to explain to my client why the person they were counting on to get pictures of them performing didn’t get them because he got thrown out before the event even started. Having that coveted all-access pass certainly makes the job of photography much easier. As with travel, sometimes getting one is half the fun. My hat is off to those photographers and journalists covering stories on a military installation at times other than an open house. My recent experience is a walk in the park compared to what they have to go through to get credentials to get on base.